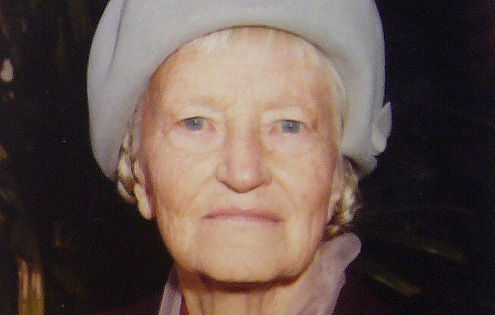 Isobel Bowden was born in Woodford in 1908, and died in 1986. The photo above was taken at her investiture with an OAM in 1985 ‘for services to conservation and botany in the Blue Mountains’. I’m just one of hundreds and thousands who loved Isobel Bowden. We all feel as if the Blue Mountains has lost its familiar spirit. Nobody knew more about the Blue Mountains than Isobel Bowden. Nobody cared more. It was a great privilege to have known her. 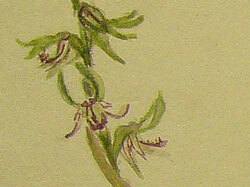 Isobel kept detailed diaries of her walks and painted botanically accurate watercolours of the flowers and plants she observed. She was a foundation member of the first conservation group in the Blue Mountains and was passionately concerned with the problem of bushfires. Where did this interest in the mountains environment come from? 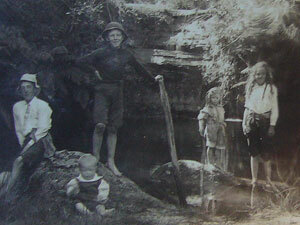 From growing up in the Blue Mountains with four siblings in what must have seemed to the children an idyllic childhood. 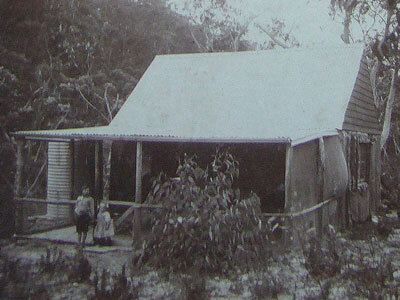 Isobel had spent much of her young years in the bush at a bush hut in Wilson’s Glen in Woodford her mother had built around 1911 called Ye Humpy. The children grew up ‘running wild’, a friend of Isobel’s said, learning a great deal about it and loving the native fauna and flora. Blissfully ignorant of the family’s heavy debts, the children were provided with a very happy childhood. 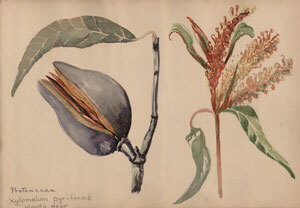 While Isobel must have benefitted greatly later from her school and teachers’ college in botany and art, she was largely ‘self-taught’, she says, but with strong links to an Australia-wide botanical artistic community. Isobel said, We lack understanding of what is happening on the ground. You’ve got to have the eye of an insect to see it like a forest. Her room at the Academy was wall-to-wall with paintings she had done of the natural world around her. The earliest water colours for which we have records are the 44 pages of a booklet, painted from 1945 to 1948, of what she called ‘Woodford Trees’ of which the Woody Pear is one example. 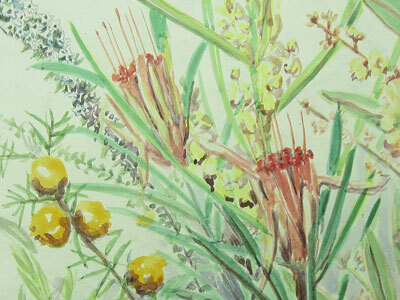 Artist Brian Kirkby comments on this water colour: You can see Isobel’s passion for documenting intricate botanical detail. Structurally it's very robust with a strong sense of design. Note also the sensitive use of tone. ... a bat flew into my room last night …and I was so anxious to help it out that I forgot how anxious I was to scrutinise it. And Christmas bells I wondered if I should cut them … why should I be the one to cut them? Perhaps people would leave them and they would be a pleasure… When next I passed they were gone … they were dragged out … I suppose I have to thank my home training … for being different … the only hope is to train children … Blow Botany lessons and plant Biology – teach them to love their national heritage and understand what its real value is. 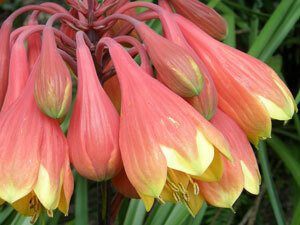 I don’t think any place in the earth has more lovely flowers than our own lovely large Christmas bells. Isobel appears to have taken her own advice and decided that, as she had to get a job because she had no money, she would put her principles into practice of getting children she was teaching out into the natural world. The Principal of Cromehurst School Lindfield employed her to teach transition in May 1946. In her Nature Notes 1, Isobel writes of taking the children to Lindfield reserve … easily reached from school … quite a number of flowers have joined my collection ... and later again I took the children to Lindfield Reserve … they were delighted with the Patersonias and sweet little Billardiera … While in Lindfield Reserve with the children I saw some ti tree in flower. In 1952, she purchased seven acres of land at Woodford which she planted with fire-retardant plants that she felt would preserve the fauna and flora from bushfire, a strong commitment to the environment that absorbed much of her attention and was well ahead of her time. 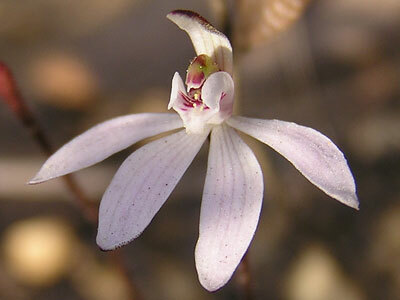 By 1953, she was becoming a public figure, communicating with Myles Dunphy, the father of the environmental movement in Australia, and speaking on 2FC (now Radio National) about Woodford orchids. But it was after 1961, when she had a serious breakdown, during which she destroyed 4,000 of her paintings, that she had her most productive period. She was actively involved in the 1961 Katoomba and District Wildlife Conservation Society by at least 1963. 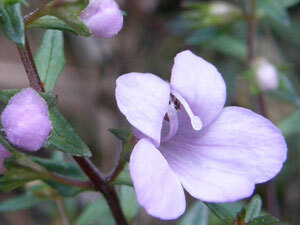 This was founded at the instigation of Bernard Schleicher president of the first conservation group in the mountains in Hazelbrook (to which Isobel belonged from the mid 1950s until it joined the Katoomba and District Wildlife Conservation Society in 1963) and the forerunner of the Blue Mountains Conservation Society which now has 800 members. She taught at Blue Mountains Grammar from 1956 until 1963. In that year, she completed her Pioneer Way map, having sold 100 copies by June. She published a short history, ‘Linden to Woodford’ in 1963. 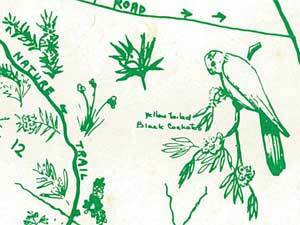 In 1963, she created a self-guided walk, with signs and notes for walkers called the Nature Track at Wentworth Falls (the map is a 4.6MB pdf). As the years pass, most people’s lives follow an ordered way. But the last few years have certainly been filled with disruption and anxiety as the weeks have gone by without any settled work to provide even the necessities of daily life. In January of this year I approached Miss McManamey to see if she would open the place for inspection and I would run a tea room with items of historic and natural history interest. She was most excited and thrilled at the prospect but after I moved in she drew right out. It was her floral diary output of paintings at this time that was extraordinary. She had almost immediately regretted destroying her Academy and other watercolour paintings in 1961 and, attempting to replace what she had destroyed, she produced the first book from August 1961 to January 1963 of such paintings, of which this image is an example. 20 other books to replace those lost followed that covered the period from then until the end of 1981, when her eyesight began to fade. 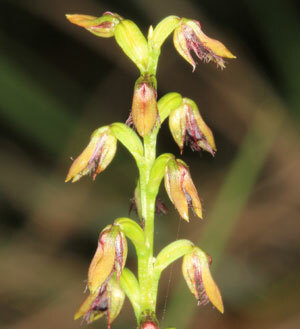 In Book No 5, for example, covering 1 May 1967 to 15 March 1968, there are 49 pages of multiple images, covering plants from places as far afield as Mt Hay, Tarana, Bell, Mt Wilson, Blue Gum Forest and Murray Park, with a fair number from such local sites as Lawson, Murphy’s Glen, Woodford Dam, Linden and Woodford Railway, the last being a favourite haunt, according to Jill Dark, in the days before the upgrade of the highway. I did not count the number of images, but I’d estimate there were some 49 pages multiplied by 20 books, roughly 1000 pages, with anything from 3 to a dozen images per page. There is a book of Isobel’s watercolours in the Mitchell Library entitled ‘The Earth’, a sample of which is on display here. In this case, Isobel is examining the effects of burning on the landscape. I held my breath, trying not to touch the earth, she said. In her later years, Isobel was unflagging in her commitment to conservation causes. Around 1978, my then mid-teenage son Matt went some dozen times to the Wentworth Falls Conservation Hut to assist as a volunteer. On one such occasion, accompanying a family friend and long-time president of the conservation society Fred Astle, he called into Isobel’s home on the way to the hut. My son remembers Isobel not only as an engaging person on that occasion, but imbued with engaging ideas which she was deeply passionate about. Isobel’s nephew Ian remembers how on one occasion in 1978 a group of Vietnamese refugees were brought up the mountains from Sydney by bus and stopped at her place. In conversation, Isobel told them not to settle in the mountains because there was already too much settlement, creating pollution. She was ever passionate in protection of mountains vegetation! Fortunately the visitors were unlikely to quite understand what she was saying to them! 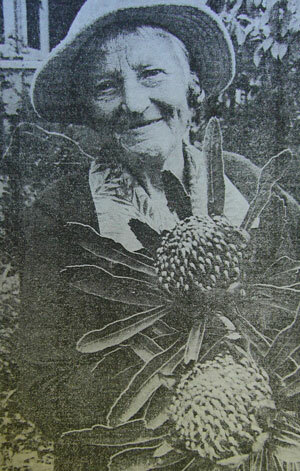 Conservationist Jill Dark accompanied Isobel on her collecting walks in the early 1980s, transporting her on one occasion to Bell in spring to see waratahs, and occasionally calling on her at home when Isobel was always curious about what Jill had found and where. Age did not dim her enthusiasm! And she had her many friends around her in the 1970s and early 1980s. Both Australia wide and on our Blue Mountains aspects of conservation especially wild life conservation are of paramount importance. We must grasp the fact that the problem is not one of withstanding further depredations but of setting our eyes on winning back what in the immediate past has been ignored or lost. We need an ongoing sense of achievement in making this country what it can become for the future and I do wish you all the very best in being part of an Australia wide awakening. 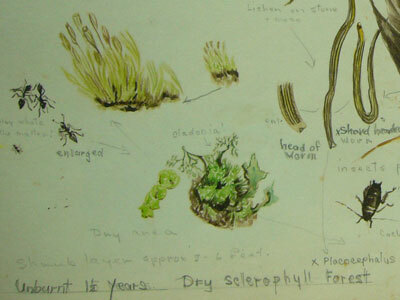 By the end of her life, she had contributed 371 plant specimens to herbaria throughout NSW, some 200 to the Sydney Botanical Gardens. 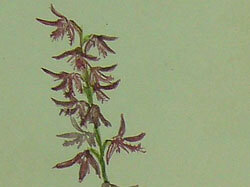 and the many thousands of botanical water colours represented by the few shown here. 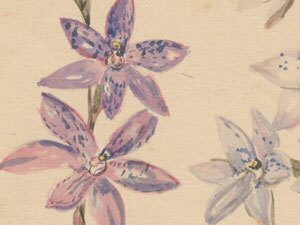 In this one, the fine detail achieves photographic representation of these delicate Woodford orchids through a sensitive use of tone, line and colour. 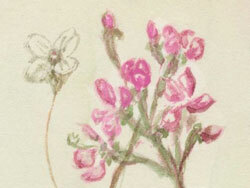 and an undated flower painting.